#EUROTAU 2018 - European scientists involved in Tau research met in Lille to exchange new ideas and hypotheses on physiological and pathological roles of tau proteins (26-27th April 2018). 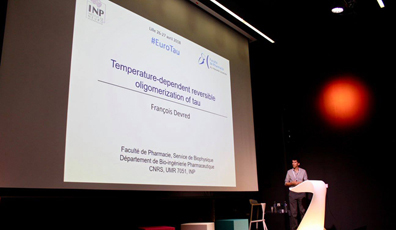 François Devred gave one of the 38 selected talks in which he presented a new reversible oligomerization of tau protein evidenced in INP team 9, which could have a protective physiological role and prevent pathological aggregation of tau in neurodegenerative diseases. Next edition of EuroTau will be in 2020.